As soon as I had finished with high school, I left home to start my life in the bush. 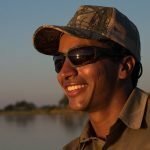 I completed FGASA Level 1 and a Tracks and Tracking course in Zimbabwe and my interest in the bush turned into a love and a passion. My first job was working as a hostess in a small camp along the banks of the Zambezi Valley, where I met Siraaj. Working at this camp I discovered another passion of mine – food! I started working for Kavinga with Siraaj in 2016 when the camp had just opened. I am the camp manager and hostess. 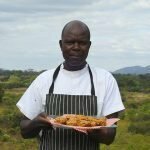 During your stay, every day I plan the catering for your safari and I get busy with making some of the meals you would eat with us! Every day I strive to make the camp like my home and welcome guests into Kavinga like friends and family.